I am struggling with this issue and so I am working it out on my blog. There are just so many motivators in our lives. Things that impress upon us, and then are gone. Other things that leave an indent, a note in our hearts that let us know this is something really important. Recently, my mom’s battle with the most insidious disease, Alzheimer’s (and unfortunately, Dementia), has caused me to sort of shut down and reflect. Truly, once Alzheimer’s touches your life in some way, it leaves a mark. Loosing your mind is just such a horrific thing. I know of soldiers who would rather have lost limbs than suffer through TBI, or Traumatic Brain Injury, which mimics Alzheimer’s and Dementia. My mother is blessed with both Alzheimer’s and Dementia. Depending upon the source material, they are strains of the same thing. One is considered an illness, one a disease. One starts the process, one completes it. I’ll explain it this way: Dementia means I can’t remember the past 10 minutes. Why am I in this room? Did I eat breakfast? What day is it? Did I talk to you earlier? And the world revolves and comes back to the same point about every ten minutes. There are periods of lucidity wherein the person knows they don’t know. And those moments hurt. When my mom and I have a lucid moment together, she knows she is sick. She knows she forgets people, places, and things. She knows it hurts us and is hard for us. And she gets very angry because she knows that soon she won’t have these lucid moments and is frustrated that she cannot stop it. Alzheimer’s, on the other hand, involves more of the physicality of the person, as well as basic memory. They forget what a fork is for, or how to use it. They forget to get to the bathroom, or even what a toilet is for. They forget to bathe. They often don’t eat. They wear the same thing, day in and day out, not realizing it. Eventually, the body’s autonomic functions are affected to the point where they cease to function, and death ensues. It is almost as if the body cannot remember how to function, and they die. A person with just dementia can live until a ripe old age. A person with Alzheimer’s has a limited lifespan. My mom, as I said, was doubly blessed. Her world is contracting. The past two weeks, it has been contracting at a rapid pace. Events and occurrences have brought her disease to the forefront. Medications aren’t really doing much at this point. We are almost where we have to start making choices for her, decisions that affect her, whether she likes it or not. We are going to have to define her level of competency. And I know, after today, that I will have to go in person soon, meet with her caregivers and physician, and start taking over the decision making for her, and it is frightening. We thought we had another 2-3 years, at least we had hoped we did, but it is looking more and more like something will have to happen in 2015. My stepsister and I have agonized over this, and we are both so very sad. My father is 88 years old. He is almost exactly 30 years older than me. My oldest son and I are almost the exact same distance in age apart, as well. My dad has always prided himself on his ability to think. He pursued, doggedly and even when success eluded him, advanced degrees. He was raised in England and New Zealand and studying in America was very difficult for him. He struggled but finally got his Master’s and PhD. And he is proud of his accomplishments. He and I have always struggled because he maintains he is always right. He told me, “I’m right until you can prove me wrong.” Ever so simply and confidently, taunting me to think more about what I wanted to share with him, never letting me be intellectually lazy. And now he has been diagnosed with Alzheimer’s as well. He has moderate-onset, which is much milder than my mother’s has become. The fact that they both have Alzheimer’s and are on the exact same medication and dosages is ironic, at best. They live in vastly different climates and situations, in different states, but both talk about one another when they talk to me, and both ask about the other. Like I said, ironic, at best. Every once in awhile, I am unable to remember the simplest things. I will think about something and my mind will be a blank, white, wall. Not even a scratch on it. Not a trace of a memory. And it scares me. Truly frightens me. I do not want to end up like my mom. My dad is at the stage where he is just angry, trying to wrap his head around his dilemma, because he is just beginning the Alzheimer’s journey. My mom is getting nasty with others and her short term memory is down to 10 minutes on a good day. And I am scared that it will be me before long. I know I can become more proactive to prevent this situation, but the genetics are there and it is frightening. I always remember relatives who were considered, “looney old aunt Mabel.” Most people had senile people in their family trees. If only Dementia and Alzheimer’s were so simple. I pray I become just senile and it stops with that, because the last thing I want to be is an emotional and physical burden to my husband or children. And I know how it feels to watch the two people in your world who always cared for you, and were always strong and there for you, wither away as mine are doing. And I wish, I pray, that the decline wasn’t so rapid and obvious. My heart is breaking. 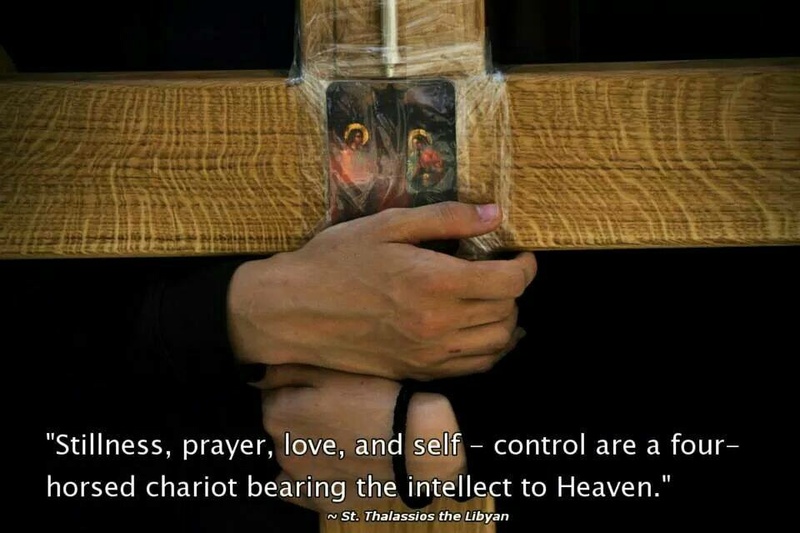 I started this post on my blog with a meme about the “4-horsed chariot, bearing the intellect to Heaven.” Those four things are stillness, prayer, love, and self-control. As someone facing the issues I have with my parents, I am longing for peace, for assurety and confidence in my future, in their future, and their eternity. My mom pretty much ignores faith in her life. She went to Church with my stepdad because he insisted on it; he wanted to go. He was Catholic and somehow was able to go to confession and receive communion; he was anointed just prior to his death. He felt at peace. My mom has not gone to Church since he passed. I believe perhaps once or twice to connect with friends, but she has long stopped attending Mass (she is not even Catholic). My dad sought out faith like a dedicated miner. He dug through a lot of philosophies. When he came up against the historic Church, however, he stopped looking. He told me once, “If I wasn’t married to who I am married, I would be Catholic.” My conundrum is that I worry for their eternity. My father has worked out his own, personal salvation with God and I am leaving it in His hands. I worry mostly for my mom because no one in her life ever bothered to catechize her and whenever I tried, she pushed me away. It actually angered her when I would talk to her about it. Although, to be honest, she told me often that she wished she had what my husband and I have…our faith. I am sorry, too. I feel like time is catching up with me on this, and I need some time to stop, recollect, ponder and work this out. Some days I feel like I am standing on a precipice and that I’m about to fall; I don’t feel like the landing will be gentle. I’m overwhelmed with regrets and sadness for the life I never had (My parents staying married; a place I could take my kids to that said, “This is Grandma and Grandpa’s house and I grew up here.”) and was not able to give to my kids (We have moved a lot). I’m sad my parents divorced and how nasty it was and how much hurt it generated, even if it was done when I was in my early 20s. The pain was intense, even for a young adult. I sought counseling for it and am eternally grateful for the therapist, who on my first visit, was smart enough to hand my a box of tissues and just sit there while I spewed. And bawled. And spewed some more. I don’t think we had an actual discussion until my 3rd or 4th visit. Ha-Ha. Smart woman. I worry about my agnostic brother, who keeps his distance and has his own demons chasing him. I regret I haven’t been able to share my faith with him and help him to find more peace in the world (he thinks religion is for weak-minded people and he has no need of it in his life). I remember so much joy in my childhood and cling to the memories of times at my grandparent’s home, surrounded by extended family. I remember the smell and feel of holding my children as infants and am reminded of their unbridled joy each time I hear my grandchildren laugh. And today I sit on this precipice with all these things around me. Some have left deep indents, and my heart knows they are important, as I said above. Some I let go, knowing they aren’t truly life-altering, and I gave them too much credence. Others, well, I am wrestling. Wrestling with doubts, fears, longings, and love. As I prepare to enter yet another Great Lent, I am looking at what I need to deal with. A wise priest once told me that during Lent, we can give things up, or we can choose to do things we haven’t tried, yet. I truly believe this meme has given me the groundwork I need to focus on, the basics, to assist my “intellect to Heaven.” Silence is something that I love and have embraced far more than most people who know me would think. Being still, and allowing silence and stillness to envelope you can be such a peaceful moment; it can heal. In the still, silent world we can erect around ourselves, we can enter more deeply into prayer. We can listen for God’s whispers in a still and silent world much easier than in the chaos of this world. When we listen for, and hear, God’s action in our lives, we are overwhelmed with Love. The love of God, of other. We can get outside of ourselves and help the person next to us. It can re-energize us enough to carry on. And self-control is much simpler in a still and quiet place we erect, filled with prayer and love. My four-horsed chariot, as St. Thalassios the Libyan so wonderfully stated. There is much work to be done to make this happen for me. I am ditching much of the social media in my life. It only adds to the noise and rattling I really don’t need to listen to, anyway. My prayer life has slackened lately and it needs to be rejuvenated. The love I feel towards my family and friends will only be more focused with stillness and prayers, and I am determined that while I can, each of them will know how much I love them. The self-control, for me, comes in regards to speech (stillness/silence), being out and about outside of my home, and my health/weight. I need to control my appetites in a few areas. Mostly I want to focus on being healthier, so I do not expose my family and friends to what I am going through with my parents. I want to be healthy for my grandchildren. I want to share their lives as long as I can, as healthily as I can. All horses need regular feeding and exercise, as well as practice. Especially horses that are destined to be leading my chariot, and in it my intellect, to heaven. 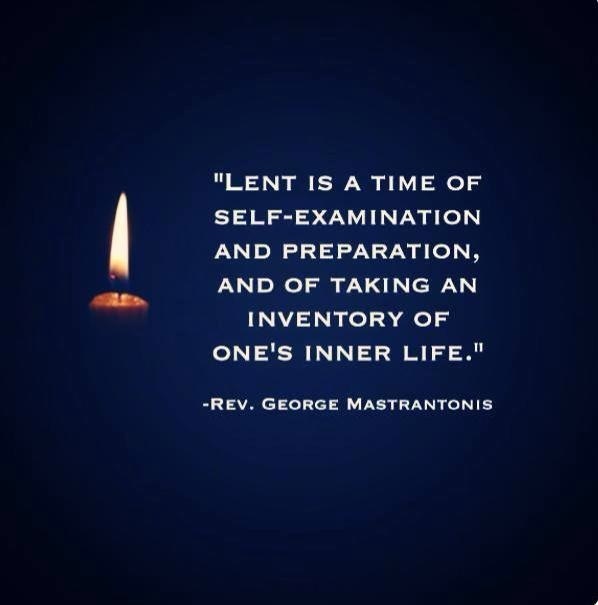 Great Lent is right around the corner. It is time to prepare. Pray for me as I will pray for you, in the stillness. I was looking at the snow outside today, and listening as various pundits spoke of the weather. Mostly they complained that the great “snowmaggedon” did not materialize (except for the people who were hit pretty hard in Maine and areas like that) and that it had cost cities millions, perhaps billions, for the waste of a snow day that did not happen. Now if the 9″ of snow New York City received would have happened in Los Angeles, they would have been glad the city had shut down. But the mayor closed the city – no buses, no trains, nothing open. And they complained about their paltry 9″ of snow. We had similar warnings up here, albeit a little earlier in the week. They told us last Thursday that we needed to be prepared for 12″ overnight and to stock up. My husband was flying in on Friday from a week away and he tried to change his flight schedule, hoping to avoid the snowfall. He could not change his flights, so we just prayed he could get home. I took the warnings seriously, seeing as how I am a transplanted Washingtonian and Californian. I wasn’t sure what could happen. Once in Washington, sections of the greater Seattle area were without power for almost a week. Trees were down, frost and snow was everywhere. People – and this is the truth – were snow skiing down some of the streets in Seattle. If you did not know this, Seattle is a lot like San Francisco – very hilly. It is built on the side of hills surrounding the Sound and is home to many shipping lines – luxury and corporate. It is one of the most beautiful cities I have ever lived in and I miss it very much. But for that storm, I was completely unprepared. Luckily, we were able to get to the store, but I could not get home because my car was even unprepared for that storm. We actually got stuck on the side of a hill and luckily some wonderful strangers helped us get home. This time, I went out driving on my studded tires, prepared with coats and gloves, and went grocery shopping. There were not as many people shopping as I thought there would be, but for mid-day on a Thursday before a big snow storm, there were quite a few people. I was able to park two spots away from the de-iced sidewalk and was very happy. After I got home and was putting away my “storm necessities,” I realized that my list was sort of silly. I realized I already had a bag of potatoes, but brought home another one. I remember thinking of all the things you can make with a potato – if you have heat and a potato, you have a meal. Up here, if the power goes out, keeping things cold is not an issue. We’ve recently been experiencing a lot of minus-temperature days. So I knew my frozen items could just be placed on our deck in the snow if the power went out. Fresh items I could keep in the house, and canned goods were safe, too. We have firewood, so heat would be okay. I also have lots of candles, just in case. I felt pretty stocked up. And we got about 6″ of snow. No big deal at all. In fact, I picked up my husband and we all went out to dinner and watched the snow falling. It was beautiful, I must say. After a while, we realized we should probably get home in case the highway was rough, but our fears were unfounded. And then I started thinking about what people grab when an emergency is pending. Today on the TV they were talking about how all the soup was gone, all the shampoo was bought out, and lots and lots of booze was gone. The weird things people grab when they think they will loose power or get stuck indoors for days on end! And they’ve been running ads on the dangers of using damp wood in your wood stove, and to only buy wood from people who show you the dampness level in the wood (who knew?). Another reason we store ours in our heated garage. But what do you take or bring home when a disaster is coming? For people who experience an earthquake, there is no preparation ahead of time; it just happens. Of course, all the safety experts tell us to prepare ahead of time for any of these disasters. Are you prepared? As funny as this may sound, I am unsettled, and feel unprepared for any sort of storm or disaster, because one of the things that is not taken care of is our house has not been formally blessed, yet. We’ve scheduled it and things have come up. We’re going on two years without a blessing. Do people prepare their homes for disaster? We make sure our insulation is good; we make sure our different sorts of alarms are working; we make sure our windows seal out the cold, but do we make sure God is at the center of all of it? Do we have our priest/pastor come over and pray over us and our homes? Do we expel evil through prayer, asking the Lord to be in the walls, a protective roof over our heads? Do we allow all the evil and ill will to come into our homes with no protection? Think about what sounds and images can come into our homes, inadvertently as it may occur. We watched a movie last night that we had seen at the theatre. We remembered being bowled over by the story line and exhausted as we left the theatre. and sad at the horrors of war it portrayed. So when it came out on DVD, we got it (what was I thinking, I think now). I made lasagna and garlic bread and we prayed over our food and sat down to watch as we ate. Fairly soon, my husband and I started to exchange looks. I did not remember the vast amount of profanity in this movie. I actually googled it during the movie itself, and the “F” word was used more than 108 times. And I was deeply bothered by it. I looked around at our icons and the crosses on our walls, and I was ashamed, as well. Why did I expose myself and my family to this sort of entertainment? How did I shield my family from it? Well, there was no blessing in my home to thwart evil. I silently prayed that God would place a mantel of protection over us and help dispel the evil I felt encroached into our home by the use of so many horrid words. How do we prepare for the horrors in this world that may visit our homes? What if war were to break out in the USA? Are we prepared to thwart evil? Can we subsist in our homes, huddled against encroaching evil? If we think about all the things we struggle with in terms of an actual battle, perhaps we can take it more seriously. Perhaps having our house blessed will prepare us inwardly from outward manifestations of evil around us. Decorating each room with a cross or icon, or other symbol of our faith can give us comfort. I love just looking around and being able to know I am a child of God, no matter which room I am in. Even laundry rooms and garages can be dedicated to God. I have icons in my kitchen, bathrooms, bedrooms, office area, even on a flag flying outside my house (one of those garden flags). I try to live my faith in everything I do. I try to be prepared by having that “extra bag of potatoes” in my life wherever I happen to be. I wear a prayer bracelet and some sort of cross daily. I arm myself. My mother-in-law always had music in her home and it was always religious, Christian music. I once asked her why she always played that particular type of music. Her response to me was that she was such a weak-minded person and poor Christian, she needed it around her all the time so she could keep trying. I was humbled and embarrassed. I wanted country music at the time. I now prefer Christian rock music, for the same reason. There are “snowmaggedons” preparing to dump on us from all sides, at all times. As I age, I realize it more and more profoundly. And I pray people will become aware of the need to prepare for eternity as eagerly as they prepare for a storm, as eagerly as they rush out and buy the most recently released DVD, without stopping to think what they are bringing into their home, and into their refuge. As I age, I feel the weather more deeply in my bones. I really hate the seasons changing, because I usually ache with the changing pressures. I love the seasons, but my body lets me know when these storms are coming. Impending rain storms are particularly noticeable. And my heart tells me more and more that my days are numbered on this earth. Being prepared means being faithful to my beliefs and the practices of my faith. I also need to remain vigilant “against the wickedness and snares of the devil.” We all have a choice in all of these matters. Preparation is key to facing them. I’ve been learning so many new things. And I think that is what is keeping my mind fresh and myself engaged. I find it so easy to disengage from the world around me. I am actually a homebody. I prefer being at home to being almost anywhere else. I love curling up with my little Schnauzer next to me, enjoying a cup of tea, and reading a good book. Especially when it’s a little nippy out. Recently I experienced a first – I went ice fishing. Now to be honest, I was there totally as an observer! I did not get near the fishies or the poles. I was having a hard enough time walking out onto this humongous lake…a lake that was frozen. I was so nervous about it. But I saw teams of dogs and their mushers rushing around the perimeter, lots of other little, red fishing tents out along the lake, families walking with their kids and dogs along the lake, and even kids running around and JUMPING. Yes, jumping. I was nervous so the smarty-pants friends we were with all jumped in the air at the same time, to assure me the ice was thick and solid. I saw the auger, I saw the hole, but I did not feel the jumping. I felt much better. I got to go inside the tent where it is warmer and so quiet. I was amazed at how clearly you can see the fish swimming all over under the ice. I was told it was 3-4 feet thick (women are notoriously poor at measuring things using our eyes and I have no idea if they were playing with me or if that was an honest guess!) and not to worry. They were catching rainbow trout. In January. In a lake in Alaska. Seriously, where did I think the fish went? Migrated with the birds, going south for the winter? I had actually never thought about it, but nonetheless it seemed awfully strange to see fish swimming beneath 4 feet of solid ice. I walked around and spoke with friends, and got to see my husband catch a fairly decent-sized rainbow trout (it was THIS big). The wind had come up and I decided I had enough outdoorsiness for the day and headed back up to the lodge. It was a glorious day and I am so glad I fought my instinct to cuddle up with a book and went. Our friends are such good people and we had an amazing day. And I learned something new, living here in Alaska. I know I have so much more to learn, that I am glad I’m not too complacent about it! Alaska has had an effect on us. We are happier in more remote places, with fewer people around. We are spoiled because there are pretty much no lines to get into for anything here, except perhaps hot coffee. If you thought Seattle was over-the-top with coffee kiosks, come on up to Alaska. Once I started noticing them, I found them everywhere. And entrepreneurs will take advantage of almost any sort of shelter to sell coffee from. There are abandoned train cars renewed with bright paint, promising an amazing brew. There are former film drop-off places now selling coffee. We have an array of ways and means to get coffee here and we drink more of it than you can imagine. Mostly because it’s pretty cold most of the time. But we’ve acclimatized to that, as well. I can survive a winter wearing a sweater, t-shirt, scarf, gloves, jeans, and short winter boots. Sometimes I will wear a coat if I am feeling chilled. But usually a warm scarf gets the job done. It’s weird, because my daughter-in-law remembers her first visit to us in Southern California for Christmas. It was about 67-degrees and I was in a coat and I was cold, whereas she was wearing just t-shirts and shorts most of the time. We laugh about it now, because summers here are in the high 60s and low 70s and we sweat buckets! Ha-Ha. We have tried to acclimatize to other things and some things we are having a more difficult time with. The norms we experienced as people of faith are not present here and it creates a longing inside. I’ve resorted to reading and praying, in order to fill that void. I can relate to people who have been told they cannot worship their God by countries and political factions. It is certainly nothing as harsh as that, nor does it mean a life or death situation, not in the least. We have good people and good parishes to attend, but they are not the more orthodox expression we are used to and miss. Celebratory events are not the same. Some of the fervor is not there. Traditions are different. Much of the difference has been fun to learn – cooking, eating, drinking traditions – those are all fun to learn and try. I love how truly universal the Church is, when you see the multitude of expressions we have. In fact, this week, the Pope announced a new suri juris church in the world. That has not happened in so very long. Most people, when they think Catholic, they think Rome. Just like most people, when I say I’m from California, think Disneyland or the beach. And when you mention you live in Alaska, people assume you use a dog sled to get around and live in domed ice homes once called igloos. Pretty far from reality. Within the Catholic Church, there are as many Churches as there are nationalities and traditions. When Christ instructed the Disciples to go out into the world, baptizing in the name of the Father, Son, and Holy Spirit, they did as they were told. They combed the earth and established His Churches all over it. And most of those Churches still exist. They exist as completely autonomous churches, in communion with Rome. That does not mean we embrace Roman traditions; we have our own. We are the churches where ethnicity is cherished and celebrated. I have personally been to parishes that celebrate the Polish, Russian, Ukrainian, Romanian, Lebanese, Syrian, Palestinian, Persian, Egyptian, Indian, and Greek traditions and they are incredible (and there are many more besides this limited listing. And if I forgot one, please forgive me). Each one has its own way of expressing faith in God and can encompass singing style, dress, iconography, and celebratory foods. There are foods I feel blessed to have been introduced to, that I never would have had the courage to try, if I had not been at a parish that ethnically ate that way. And I miss some of them so very much. Each area, each church, has its own way of doing things. And none of these churches are Latin Rite or Roman, but each is as validly a Church as the Church in Rome. The patriarchs consider the Pope the “first among equals” and join with him in celebrating our Catholic/Christian faith. And I am glad I am open to learning new ways and new things. It has helped me to embrace a much larger, more universal faith than I had up to then experienced. Knowing there is more out there to learn about is exciting. I do, however, long for some of the traditions I was taught. In the Melkite Greek Catholic Church, we only have Divine Liturgy (during regular times, and not Lent or the preparatory time before Christmas) on Sundays. And only once on a Sunday. There are not a myriad of times to choose from, because in the East, community is almost as important as our faith. We keep together, worshipping and celebrating as one community, at the same time each week. We enjoy Vespers two to three nights each week, and within the vesperal readings and prayers, we learn about all the heroes of our faith, and these readings also help us prepare for the fasts and feasts coming up. There is no surprise. “It’s a Holy Day today? What one? Who’s that saint? When did we start doing this?” We don’t have that sort of experience, because vespers lead us to the days of the church, in each year and cycle of the faith. We also do not become complacent in our celebration of Divine Liturgy, because it is only one day per week… not daily, nor several times a day. There are many other traditions in prayer and worship that I love and miss. I miss the exuberance expressed by our priest and our cantors, and even our deacons. They will shout when it is called for. They will be quiet when we need to be. The lead us in celebrating; they lead us in repenting. They lead us towards an exciting faith experience each time we attend vespers or Divine Liturgy. I miss the exuberant distribution of incense. There were days when we would open a window or a door, just so we could see. The incense was so thick and the scent was amazing. If you do it right, incense just enhances your sense of smell. If it is done wrong, you will burn the incense and smoke and stink everyone out – coughing and hacking instead of worshipping. I remember my eldest son assisting as an altar boy in his teens. He and the other altar boys had a contest to see who could make the most smoke during Mass. The priests were trying not to laugh and trying to be diligent about getting the incense under control, but we had to open two side doors, just to breathe. It was so funny. In the western, Roman Church, incense has been reduced to holy days in most parishes. In the East, incense is an integral part of our Liturgy. And I love that. The sights, sounds, and smells of our faith experience cannot be understated. It is integral to the entire experience, and I miss some of that exuberant expression. I know that I am still learning and adapting to an environment I could never have imagined living in before. And I am glad I am still adept at adapting (love that play on words) because change can make us cranky people. If we embrace where we are, realize it is where we are, and learn from it, we can find happiness. I cannot continually long for the “good old days,” but I can share what I have experienced along the way. I can share foods and traditions that many up here have no clue about. I can share the history I know, and I know that will shake some people up. But if we can somehow share back and forth, and experience a more give and take environment, I know we will all be better for it. Learning how universal our Church truly is, well, I think that is a blessing. The Disciples did as they were told and went into the whole world, bringing the Word of God into each corner. I bring my Southern California and Washington experience into the “last, great, frontier” and in turn I am shown things I could only imagine. My prayer is that we can all be open to “other” and “different” and see that God enjoys the many and varied ethnicities who worship Him in song, celebration, foods, and dances. For a SoCal gal to go ice fishing is pretty amazing. For someone from a warmer climate, and all the foods and traditions that come with it, to adapt to this environment (at my age no less) is pretty much wonderful. I am just hoping this environment will allow the warmth and traditions from the lower 48 to enliven what they have, too. It would be a win-win! And no one has to jump up and down to prove we are sturdy and solid in our faith, we know that. Although I will admit, out on that frozen lake, I appreciated the sturdiness!! I am hoping to continue to grow into a more well-rounded Alaskan, experiencing the amazement this land has to offer. And I hoping I can share where I’ve been and what I’ve learned along the way, enlivening all of our lives of faith.